This a Ford Cosworth BDG engine in Component form it is effectively all the correct components to build the highest quality race engine including clutch, Starter motor and Slide throttle induction with Carbon air intakes and electronic injection, originally purchased for an abandoned race car project. Quaife 90.4mm alloy BDG block. DKE engineering 72.50 mm Steel billet crankshaft, lightened counter balance, narrow journal, lightened crankpins. Arrow precision H section narrow pin 5.23" steel connecting rods. Race Engine Components valves 1.400" inlets REC 256 and1.200" exhausts REC476. Arrow precision lightweight steel cam followers CF326 andCF325. Cylinder head stud, nut kit. Steel billet jack shaft including steel thrust plate. Titan BDG 4 port Dry sump pump. Steel sump pan with full length scavenge trough. Front timing cover complete with seals. 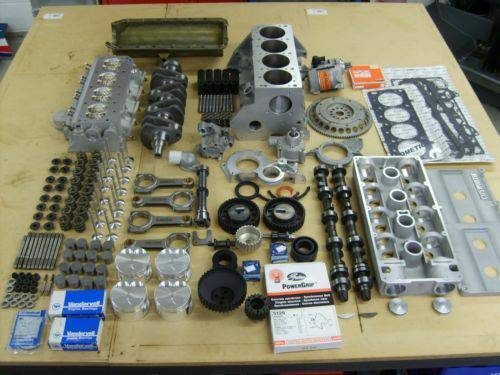 Complete set of timing gear Adjustable Alloy cam pulley's, Back drive water pump pulley, Alloy jack shaft pulley, Steel crankshaft pulley, Alloy tensioning and fixed Idler's including posts, studs, and bearings Gates drive belt etc. Rear crankshaft oil seal housing and seal. BDG Cam Carrier with cam bungs and thrust keys and locating studs. Camshafts from new blanks profiles F1 and BLF17. ARK Racing Starter motor systems Compact light weight 1.4 kw starter motor and super lightweight 235mm steel flywheel for 5.5" clutch. Cometic steel multi-layer Cylinder head gasket. Slide throttle Intake fuel injection system.